Blacktop Mojo makes rock music for the American working man, because that's who they are, and that's who they care about. Ray Zalinski quotes aside (although that statement is pretty true), the bands’ sophomore release Burn The Ships is, not to mince words, one hell of a rock record. After “Where the Wind Blows” and “Burn The Ships” set the table for things to come on Burn the Ships, the band tugs at the heartstrings on powerful ballad “Prodigal” (‘One of these days I won’t be around / I’ll rip my roots up from this ground,’ frontman Matt James wails) while delivering one of Burn the Ships’ most memorable guitar solos before things take a turn for the heavy on colossal standout “Shadows on the Wall” and “Sweat,” a stomping homage to the blue-collar working class (‘If sweat were money I’d be a millionaire / I make my living on sweat and blood’); “8000 Lines” is a dynamic outing that combines demonstrative riffing with warm guitar plucks, instant classic “Chains” pretty damn well defines Burn The Ships in four minutes and acoustic closer “Underneath” showcases James’ immense vocal skill even further. 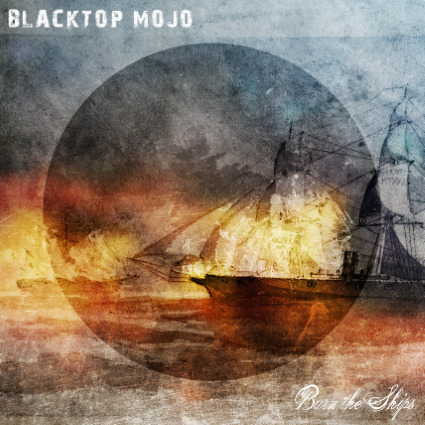 Blacktop Mojo places an emphatic stamp on Burn the Ships with a sensational take on Aerosmith’s “Dream On,” a song that is immeasurably difficult to get right, adding a bit of southern rock to the timeless track. With ammunition as potent as Burn the Ships, Blacktop Mojo have what it takes to be one of the next great rock bands.